Like to join us? Submit the form at the foot of "About Us" page. The Derby/Nottingham Branch’s previous submission for consideration for the Vincent Metcalfe Trophy Award was in 2003. Since that initial success, we have consciously maintained efforts to promote the Aims of The REME Association and to remain at the vanguard of Association business. We are pleased to provide details of our submission outlining our efforts at the branch during 2008. It is with some excitement that we are able to announce that our submission was recognised as the "best in class" and as a consequence the Derby Nottingham Branch has been awarded The Vincent Metcalfe Trophy for an unprecedented second occasion. It is a major credit to all members for the work and effort each and everyone of them have contributed to this success. The Branch maintained strong links with the Corps during 2008 through a series of initiatives specifically targeted at raising the profile of the Branch and Association. We enjoy excellent relations with Chilwell Station and the local Branch of the RAOC Association with joint projects a feature of those relationships. We have also established continuity since BEME 49 East (Bde) joined the Branch Committee and his active involvement has been beneficial to both parties. Closer ties with 73 Eng Rgt RE LAD (V) have been achieved by including the unit’s OC as a Branch member. The Branch is justifiably proud of its ability to respond and deliver on Welfare issues. Our Welfare activities extend beyond the Branch to the wider Services community. Annually we make donations to The Royal British Legion, SSAFA Forces Help and additionally in 2008, to The REME Benevolent Fund. During 2008, the Branch made donations totalling over £500. Members also made significant individual contributions to their chosen charities during the past year. One member, who raises funds for The Royal Star and Garter Homes, contributed over £260 by running the Leicester Marathon beating the current over-seventies record (his class) by 50 minutes. Another member is the ‘ Poppy Appeal’ organiser in a local town and was responsible for raising over £22,000 for The Royal British Legion in 2008. Welfare is a multi-tasking role that we carry out in the best traditions of the Corps helping those in need. This is exemplified by the case of one elderly member who, due to serious health problems, had to move 30 miles away to allow family to respond more effectively to his needs. He was keen to maintain contact with and continue to attend Branch Meetings despite his need of assistance with walking. The initiative of two Branch members have made this possible, They have created a ‘Shuttle service’, one picking-up the member up before and the other delivering him home after meetings. This has all been done at their own expense with the result that the member concerned has not missed a meeting to date. This example underlines that Welfare is not just about spending money. The goodwill ingredient is vital and epitomizes the true meaning of welfare and comradeship thus making us considerably more effective in this area. Project Santa was generally recognized as a resounding success. Branch members, never doubted the project was deserving of their wholehearted support as they felt it would help raise the morale of our soldiers, and bring lasting benefits to The Association. Therefore, we heartily congratulate the Branch Member who was responsible for this initiative, and who completed the project management and organisation with enthusiasm and skill. He was overwhelmed by the response from other Association Branches and participation by other organisations, making it possible for all REME personnel on both Op Telic and Op Herrick to receive an individually prepared Christmas gift. The response from our serving colleagues was one of unanimous appreciation thus raising the profile of The Association and forging a meaningful relationship between us. The nameplate ‘Craftsman’ is now back in daily service on its original Class 47 Locomotive No 47501, one of Direct Rail Services fleet. The Branch has kept in close touch with developments since 2002 when the locomotive was sold into private ownership and our determined efforts came to fruition with the renaming of the Craftsman during 2008. The recruitment of new members is a priority and the Branch remains buoyant with several new faces joining in 2008. Our web site was re-written during the year to give it a more dynamic look; it remains our principal source of attracting new members. Social activities play an important role in providing an opportunity for those who enjoy the interesting and informative venues offered and these are always very well supported. During 2008, among other outings, we enjoyed trips to Jaguar Cars, JCB and the Bell Foundry in Loughborough. The joint venture between the Branch and Chilwell Warrant Officers’ and Sergeants’ Mess to visit The Royal Hospital Chelsea, followed by an informal social evening hosted by The Royal Regiment of Fusileers in Hounslow was a reflection of the co-operation which we enjoy with our host’s at HQ Chilwell Station. The Committee are highly proactive and meet usually 6 to 8 times a year to prioritise branch activities and discuss / agree recommendations for Branch expenditure, policy and events. Having said that, the Committee’s approach is always collaborative with Branch members’ views and opinions being sought and included with votes to determine and ratify future direction conducted at meetings. 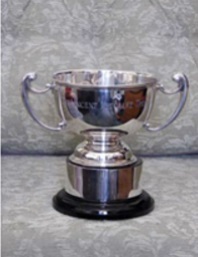 The honour of receiving The Vincent Metcalfe Trophy in 2003 reflected our commitment and performance at that time; the trophy replica is always exhibited with pride at Branch monthly meetings. The Derby/Nottingham Branch is proud of its continued achievements and is determined to maintain and promote the traditions we up-hold in the future. It is against this backdrop that we have no hesitation in respectfully submitting our activities and achievements during 2008 for consideration for approval of the Award.